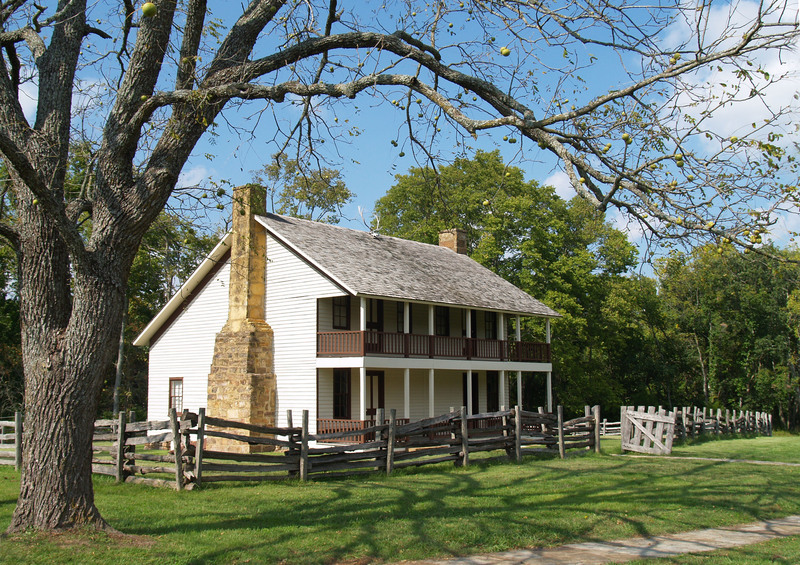 Elkhorn Tavern, Pea Ridge National Military Park, Garfield, Arkansas. The Butterfield Overland Mail route traveled by this site between 1858-1861. After California was admitted as a state in 1850, its leaders demanded a transcontinental railroad be built to the state. After six years with no congressional activity, Californians requested that mail service be improved while they waited for the railroad to be constructed. In early 1857, the Post Office Department put up for bids a mail contract that would run two times a week and in twenty-five days from the east to San Francisco. John Butterfield was awarded the $600,000 contract and it was to go into operation in September 1858. Butterfield chose St. Louis, Missouri, as his eastern terminal; to satisfy some political factions, he also made Memphis, Tennessee, as an eastern terminal. The routes met at Ft. Smith, Arkansas, before continuing on to the western terminus of San Francisco. It took a year of frantic and grueling work to get the Butterfield route planned, built, and equipped. Preparatory work included building bridges, launching ferryboats, cutting down creek banks, digging wells, grading roads, and clearing mountain passes for travel. Along his 2,795-mile route, John Butterfield placed 135 relay posts and way stations. (Another thirty-six were built later.) The relay posts were spaced so the distance between them could be traveled at a rapid pace, under any weather conditions, and without danger of exhausting mules or horses. At each relay, living quarters, stables, and corrals were constructed. The stations were equipped with blacksmith and harness shops and emergency horses and mules. Elkhorn Tavern (a modern recreation of the building is pictured above) was a flag stop where travelers could pause to enjoy a meal or liquid refreshment. In September 1858, after a year of preparation and more than one million dollars in expenses, the first Butterfield Overland Mail Company stagecoach left Tipton, Missouri, headed to San Francisco, California. (A 160-mile railroad connected St. Louis to the stagecoach trailhead at Tipton.) The following day, a Butterfield stagecoach carrying an accumulation of mail left San Francisco headed for St. Louis. Both arrived at their respective destinations on October 10, 1858, thus inaugurating the first continuously-traveled transcontinental mail and passenger line in U. S. history. At the height of its success, the Butterfield Overland Mail Company employed more than 800 people, with 139 relay stations, 1800 head of stock, and 100 stages (thirty-four Concords, sixty-six celerity wagons) in service. John Butterfield’s Overland Mail company continued until March 20, 1860, at which time, he was voted out of office and replaced by William B. Dinsmore of Adams Express as president. Butterfield remained a director. The Overland Mail contract was transferred in March 1861 to the Central Trail because of the Civil War. Butterfield’s stages were confiscated by the Confederates in Texas. Eighteen stages were transferred to the Central Trail by the Overland Mail Company on the Southern Trail.